Goatsden is music, film, and spirits. The hidden and subversive. The high and low. Exorcism has long been used effectively by the Catholic church as a tool to assert power and fear among the faithful. As a dramatic, fictional subject, is there any proper follow-up to the now-classic William Friedkin film adaption of the William Peter Blatty novel, "The Exorcist"? I think not. Call me a cynic, but nothing since that 1973 film can hold a candle. 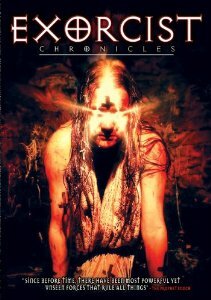 "Exorcist Chronicles" is certainly no threat to that assertion. This low-budget English indie pits a young Catholic priest and a female scientist (who tends to wear skimpy outfits) against a string of demonic possessions plaguing Derbyshire and Glastonbury. A reliance on silly digital effects and visual filters do more harm than good here, but the coup-de-grace is the plodding plot and disjointed storyline. Acting is reasonable enough, and there are a number of appealing breast shots, but there's little else here to recommend, sorry. Feliz Ano Novo: Um bom 2015!